Penelitian - China has begun constructing an offshore wind-power project with the biggest installed capacity in the country. The wind farm's first turbine was installed Monday in waters off Nanpeng Isle of the city of Yangjiang, south China's Guangdong Province. The project, with a planned installed capacity of 400,000 kilowatts, is expected to generate about 1.46 billion kwh of electricity annually when it goes on stream in 2020, according to its developer, China General Nuclear Power Corporation (CGN). "As a coastal province, Guangdong enjoys abundant wind resources. Wind farms will play an important role in adjusting the province's industrial and energy structure, so as to promote green and high-quality development," said Chen Yabin with CGN. 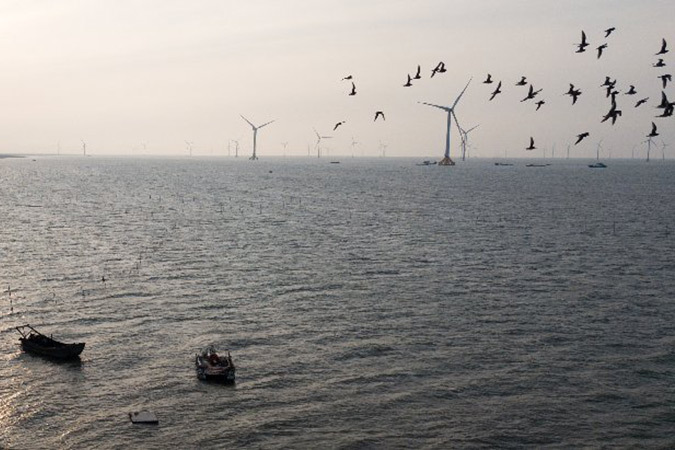 Guangdong plans to build 23 offshore wind farms before 2030, wth the combined installed capacity to hit 66.85 million kilowatts. Wind has become China's third largest power source after coal and hydro. According to the Global Wind Energy Council, China ranked the third in terms of the total installed capacity of offshore wind turbines, accounting for 11 percent of the world's total as of the end of 2016, after Britain and Germany.